Sanitary Napkin Package, Johnson & Johnson, circa 1890s. 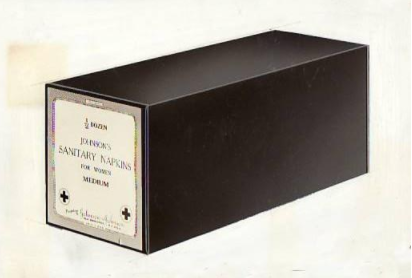 Johnson & Johnson produced the first disposable sanitary napkins for women in the 1890s. These early pads were not a successful consumer product. Their cost was prohibitive for many women and drugstores sold them from behind the counter, making purchasing napkins embarrassing. The shape and clear labeling on the box also made clear what women were buying.